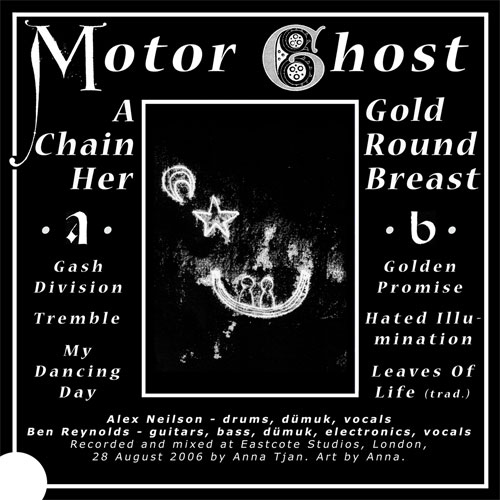 MOTOR GHOST is the new project of drummer / vocalist Alex Neilson and multi-instrumentalist Ben Reynolds. ‘A Gold Chain Round Her Breast’ is their first recorded document as a duo. From the brooding opener through tracks of soaring electricity to the beautifully fragile a capella rendition of the folk song ‘Leaves Of Life’, this album sees Alex and Ben exploring darkness and light and all shades in between. Alex’ drumming provides much of the backbone of the album supporting and conversing with Ben’s acoustic and electric guitars, loops and the call of the dümuk (a Greek horn). The album comes in screenprinted sleeves, all of which have been hand embellished and are individually numbered. The first 100 copies of the album include a 3” bonus CDR containing a four song solo vocal set Alex performed at the Macbeth in London the day before the MOTOR GHOST studio session and feature exclusive and extensive liner notes by Scottish folk singer Alasdair Roberts. Bonus disks have SOLD OUT.